You may have heard talk of a little band called U2. You know, Bono, the Edge, “Sunday Bloody Sunday” and such? Well, they’ve been in the news lately for their Joshua Tree Tour, and for featuring the poetry of several talented poets during their concerts. In keeping, we’re pleased to announce that the work of one of our very own PQL poets, Margaret Avison, is one of those featured during the performance! To commemorate this event, Porcupine’s Quill Printer and Publisher Tim Inkster has designed a free, high-resolution printable broadside for all you Quill fans to enjoy. ‘Not the Sweet Cicely of Gerardes Herball’ first appeared inWinter Sun (Routledge, 1960) and then later in Always Now: Volume One (Porcupine’s Quill, 2003). This presentation is typeset in Junius, a letterform developed at the University of Virginia for use, primarily, by mediaevalists. The ornaments are courtesy of the graphic resource collection of The Devil’s Artisan. 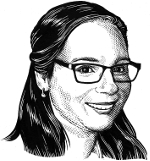 Click here to download the broadside. We hope you enjoy this commemorative broadside. 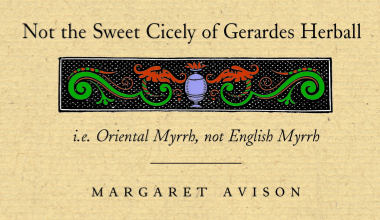 Be sure to check out some of Margaret Avison’s lovely works, such as The Essential Margaret Avison, and all of the volumes of Always Now—One, Two, and Three. You won’t regret it! This entry was posted in Letters from the Porcupette (the Intern's Blog) and tagged Always Now, giveaway, margaret avison, The Essential Margaret Avison. Bookmark the permalink.